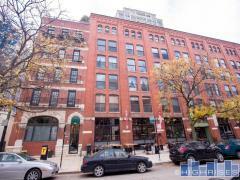 600 S. Dearborn Street is a well-established high-rise condo in the great Printers Row area. It was built in 1915 as an office building and then converted to a rental building in 1980. In 1996, it became a condo building with mixed use commercial space on the first floor. There is an on-site building manager, a common laundry room, and no attached or detached parking. The building is 22 stories tall, is FHA approved (as of 05/19/2014) and has 283 units total, and allows in-unit laundry. Rental and purchase parking options are available within 2 blocks. Have any comments or questions about Transportation Building? Ask your question and/or share your thoughts about this Building.